Here's some theoretical rambling. May help, may not. I wonder what's special about the cutter. Weight on the 3ph? Length of operation? Maybe it's length of operation, and the only time the tractor is run for a long time is with the cutter. I can't speculate how weight on the 3ph would affect the problem (Spread a fine crack more, or a seal?). The suction line probably does pick up in the area of the 3ph. I guess the flow control valve could be turned off, and that might help isolate the problem. I remember a comment about a cracked part (maybe the suction line housing on the pump) that introduced air into the pump. Perhaps air in the line, leading to cavitation, could explain the problem, and why the hydraulics come back after a rest. I realize this is pretty far-fetched, but maybe inspecting the entire suction line would help. I wonder how the oil looks when the hydraulics aren't working? Heat is the other thing that comes to mind when I think about things that stop working after awhile, and then start working after a rest. However, I suppose you've had enough of my rambling, and so I'll stop. Please keep in mind that I'm real long on theory and real short on experience with this subject. Just a question. When you change the hydro oil, does it have small air bubbles in it? David. Have you got the valve that controls the drop rate of the 3ph. wide open. I have had some similar problems on my 1710 when that valve was closed down to transport something. When reopened I would have to cycle everything several times to get operations back to normal. I am assuming from your post that you are running the hoe off the tractor hydraulics and not a PTO pump. The problem is the by-pass or pressure-relief valve. It is there to protect the pump and everything else, including you, from the effects of too much pressure. Since it is physically impossible to compress a liquid (the whole basis of Hydraulic potential) there must be something to limit the pressure in the system. The valve is a very simple affair, basically it is a cylinder with a piston in it. There is a spring behind the piston, keeping it in such a position in the cylinder as to block the fluid's path to the return line. When a certain pressure is reached the force of the fluid exceeds that of the spring and the piston moves back, allowing the fluid into the return line and by-passing the rest of the cylinder. 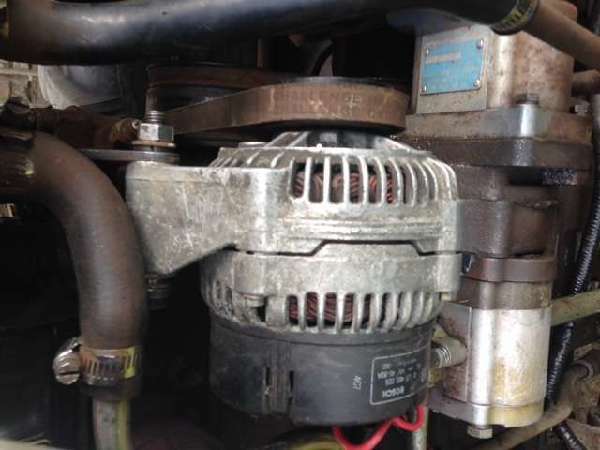 It is common for this valve to either 1) outright fail (usually the spring breaks), or 2) intermittently or partial stick open (usually because of debris), causing the symptoms you have described. When you shut the machine off all hydraulic pressure is released, the valve closes and everything is "normal" until the next time you exceed the pressure setting of the valve, it opens, sticks that way and you have no hydraulic power because the fluid is going straight back to the reservoir. Every machine is a little different as to location, etc. of the valve but I'm willing to bet if you replace it your problems will be over. Best of luck. Before the filter mount problem it was frothy, telling me the thing was getting air. But I haven't seen that after the repair. I just now was using the brush hog again and same problem, no hydraulics, when I got back to the barn, I shut off the tractor, fired it back up and the hydraulics worked. I checked the oil level, it was OK. It may not be all the way open, I will try that. I do not ordinarily close it. You know, that might be it. I was thinking the other end all the time, that it wasn't getting enough oil, hence my preoccupation with the filter. I have had this valve apart, when I took the system apart, and checked it for debris, visible wear, etc. That is when I tried to replace the O-ring. There is leakage by the spring loaded valve and I have to keep a close check on the level of the fluid. Sounds expensive, but it may just be the solution. I will look into it. Thank you all for your input and suggestions. All of these things I have also thought about. One thing that gets me though, is the shut down and restart of the tractor are immediate. One of the others answered me on that and it sounds reasonable. The crack was in the mount for the filter (spin on). I replaced that. The oil was frothy before that, indicating air in the line. The mowing time is generally about 3 to 4 hours. Last two days were scorchers. I thought the oil might be thinning out too much, but restarting blew that theory. There is no leak in any seals, only in the pressure relief valve. I didn't think it was enough to rob power, but it might be. Before replacing that unit, as was also suggested, I'm going to make a test. The next time it happens, I am going to tunk on the valve casing and see if it resets. Maybe the oil was hot enough to cause it to stick open because of the metal expansion. I don't know if the tolerances are close enough for this but it is a thought. Talk about rambling. Thanks Murf. I'll add the pressure relief and then bled-down at shut-down to my rambling list of things that stop working and then start again. I know I can hear when my pressure relief valve is open. I guess a question of whether the relief valve can be heard wasn't asked. However, I don't know if a partially open valve, which couldn't be heard, might be the problem.